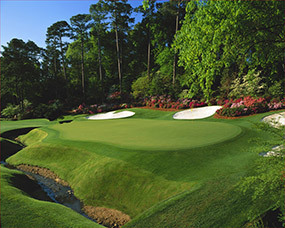 Owners of the most revered golfing grounds in America, the Augusta National Golf Club was co-founded by the great Bobby Jones, who retired from competitive golf in 1930 with ambitions of creating a world-class course that a small group of his friends and associates could enjoy during the winter months. Along with co-founder Clifford Roberts, Jones purchased an old tree nursery in the city of Augusta, and appointed Dr Alister MacKenzie to assist him with the design of his dream layout. Full of rolling hills, creeks and a great variety of flowering plants and trees, the site was ideal for inland golf and the pair worked closely to build a strategic masterpiece that formally opened for play in 1933. While MacKenzie devised the routing scheme and basic outline for each of the holes, Jones spent hundreds of hours testing approach angles, putting contours and adding his own design ideas. Holes were draped naturally across the bulging slopes and the greens angled to reward accurate driving and constructed with some of the most creative internal undulations ever seen. Despite opening with no rough, few bunkers and wide-open fairways and greens, their remarkable course not only provided a stout challenge to a man of Jones’ ability, but brought pleasurable enjoyment to the average club member. The layout at Augusta is routed around its beautiful colonial clubhouse, the two nines looping out and back from the highest point on the property. The outward holes tend to be dominated by tight, unforgiving green complexes, while the more exciting back nine is noted for watery hazards that come into play on each of its par threes and fives. There is also a pond hard against the green on the 11th, the most celebrated parkland par four in all of golf. The other truly world-class holes here are the 12th and 13th, the 12th inspired by a par three that MacKenzie’s friend Harry Colt built at Stoke Poges in England, and the par five 13th bending left around a brook that famously cuts in front of its putting surface. Here the challenge is driving long and as close to the hazard as possible in order to set-up a relatively level stance and an optimum angle into a green leaning sharply toward the water. 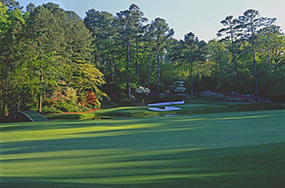 While none of the remaining holes quite rival those around Amen Corner, the outrageously shaped putting area on the bunkerless 14th and the crowned green on the reachable par five 15th are notable for the drama they provide during the Masters. The reworked par three 16th, built by Robert Trent Jones in 1947, also seems to extract great theatre, as does the monstrous par four closer, which heads through a narrow chute of trees before turning and rising steeply uphill into a tiered green. The biggest surprise for visitors used to seeing such holes on television is just how steep these elevation changes are. The drop from tee to green at the 10th, for instance, is more than 75 feet, while the climb back up the 18th fairway is almost as severe. MacKenzie took great pride in his work at Augusta, believing it was destined to become the premier inland course in the world. He died in 1934, without having seen the finished holes and only months before the club’s first invitational tournament. The following year Jones reversed his nines and in 1937 pushed the 10th green back to its current location. These were the first in a series of deviations from the initial plans, other modifications including the new 16th hole, the shifting of the 7th green and the doubling and tidying of the original 22 bunkers. There have also been hundreds of yards added to the layout in recent years and trees and rough grass grown to narrow the playing corridors. Modern green speeds have also had an affect on the design, the slick surfaces making high-spinning approach shots preferable to the bounce and run type these greens were constructed to accommodate. Although it would be naive to assume that MacKenzie wouldn’t have approved of any alterations to this course, there is no doubt that the loss of fairway width and general playability for the average golfer would concern him greatly. The reality, however, is that Augusta National has shifted from a members course to a tournament venue and those who question whether the present layout would please the famous designer are overlooking the fact that his holes no longer need to accommodate a range of skill levels. They simply have to keep the world’s best professionals at bay for one week a year. 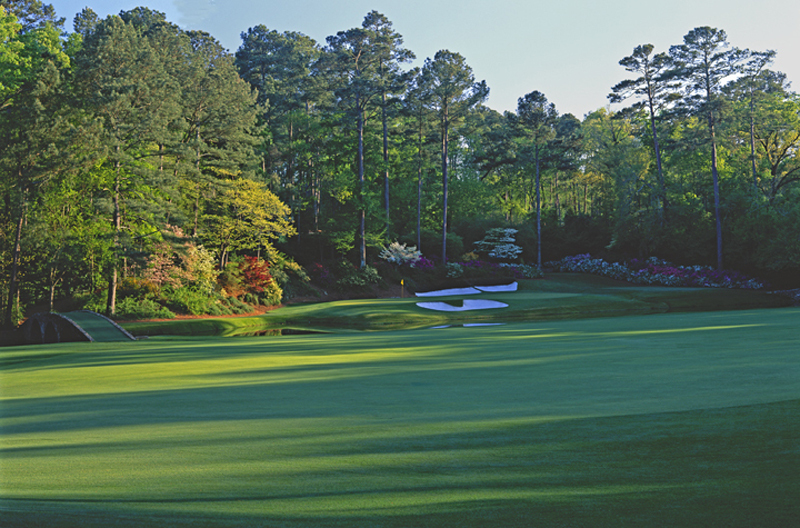 Planet Golf has partnered with Australia’s most experienced Masters tour operator, to offer a range of exciting packages to the 2019 Masters from Augusta National.